The ideal 4-in-1 Epson printer can easily fit into your office desk or home space due to its small and compact design. With a very small footprint, measuring only 39 x 37 x 22 cm and 5.9kg weight, this printer can reduce the burden of the everyday printing job. This versatile printer allows grayscale and colour printing. The Epson WF-2520NF colour printer features a built-in Ethernet interface. Hence, when a printer is connected to a WiFi router, it can provide impressive print wirelessly from compatible devices like tablet PCs and smartphones. One can fax the document within the fractions of seconds. The WF-2520NF printer incorporates Epson fast drying DURABrite Ultra Ink for professional-quality business documents which are smudge-free and water resistant. The printer has optional XL Epson Workforce WF-2520NF ink cartridges for the one who perform frequent printing.The printer offers print and scan resolution of about 5,760 X 1,440 dpi and 1200 X 2400 dpi respectively. Hence, one can rely on this inexpensive printer for printing business documents. 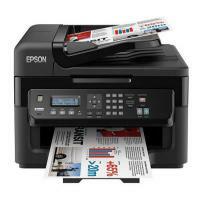 Can print from smartphones and tablet PCs with Epson iPrint. This Workforce WF-2520NF printer produces top-notch quality documents that are smudge-free and water-resistant. Although, the slow printing speed is not an issue if the printer yields better output in low budget. It offers good scanning and printing resolution, by using good quality Epson Workforce WF-2520NF ink cartridges. With the impressive range of features and compact size, the Epson Workforce WF-2520NF printer is suitable for office-desk or home projects. How to fix inaccurate or missing colours problem in the Epson Workforce WF-2520NF printer? Step 1: Change the colour setting to Color in your printer software. To adjust the colour settings in your printer’s software access Advanced dialog box. Step 2:The Epson Workforce WF-2520NF ink cartridge nozzle might be clogged. Clean the clogged nozzles. Step 3: Check for the ink alert light on the printer. If the ink light is flashing, it indicates that the ink cartridges are exhausted. Replace the previously installed ink cartridges with the new ones. Step 4: If colours are still missing or are incorrect, run the head cleaning utility and replace the installed Epson Workforce WF-2520NF ink cartridges. Also, if the printer is kept unused for a long time, replace the ink cartridges. Step 5: It is suggested not to use the Epson Workforce WF-2520NF ink cartridges beyond its expiry date printed on its packaging. How to clean the paper path for Epson Workforce WF-2520NF printer? Step 1: Remove the dust or spots on the scanner glass and the document cover. Step 2: Select Setup from the home screen using the left or right arrow button and then press OK. Step 3: After this, choose Maintenance using the left or right arrow button and then click OK. Step 4: After maintenance, you need to select Paper guide cleaning using the arrow button. Press OK and load A4 size plain paper in the printer. Step 5: Press OK and the paper is now ejected from the printer. Note: Once the paper is ejected, the printer will make some sound for a while. Don’t worry, this is normal. Step 6: Repeat the process until the paper is not smeared with the ink. Q. I am in need of more black cartridges than colour cartridges. Can I choose to buy 6 Black ink cartridges and 2 ink cartridges of every other colour in a multipack of 12 Epson Workforce WF-2520NF ink cartridges? A. Yes, you can purchase Epson Workforce WF-2520NF ink cartridges in that combination or any other combination of your choice. Q. What sizes of paper is the Epson Workforce WF-2520NF printer capable of printing on? A. Epson Workforce WF-2520NF can print on sizes such as No. 10 (Envelope), DL (Envelope), Letter-Legal, Letter, 16:9, 13 x 18 cm, 10 x 15 cm, C6 (Envelope), B5, A6, A5 and A4. Q. Will I get a refund if the compatible Epson Workforce WF-2520NF ink cartridges that I purchase from your website get damaged during transit? A. Yes, we offer a refund if the items turn out to be damaged. In such a situation, the customer needs to contact us at 048 30833221 or email us at info@printerinkcartridges.ie. We will then arrange for a replacement or a refund for the cartridges and the postage incurred by the customer for returning them. Once the item has been returned to us and tested, we’ll initiate a refund in your account. Q. Do the Epson Workforce WF-2520NF ink cartridges work with any other printers? A. Yes, these cartridges work with a range of other Epson printers as well. The list of printers compatible with these cartridges can be found on this link: https://printerinkcartridges.ie/epson-16xl-multipack-ink-cartridges. Q. What is the maximum printing resolution supported by the Epson Workforce WF-2520NF printer? A. The Epson Workforce WF-2520NF supports a maximum printing resolution of up to 5,760 x 1,440 DPI (dots per inch). Q. Is it possible for the Epson Workforce WF-2520NF printer to print using just the black ink cartridge (T1631)? A. Even if you print in monochrome mode, a mixture of all the colour inks might be used to create the colour black. However, when the colour ink cartridges are expended, you can print using just the black ink cartridge for a short period of time. You should replace these expended ink cartridges as soon as possible.